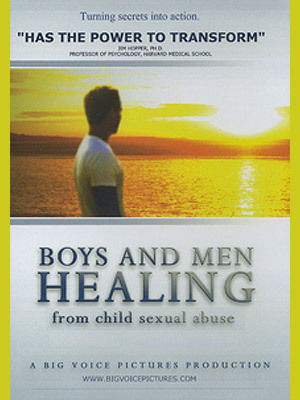 Boys And Men Healing is a documentary about the epidemic of sexual abuse of boys, the impact on individuals, families, and society, and the importance of male survivors healing and speaking out to end child sexual abuse. The film features non-offending male survivors. Whether it was shame, intimacy problems, post-traumatic stress, substance abuse, or rage that led to violence, the effects plagued their lives. Yet, each man ultimately chose the arduous task of healing, giving them a voice to reclaim their lives through counseling, support groups , and speaking out while taking action toward prevention for other boys. This documentary is a source of hope and inspiration for all men who have suffered sexual abuse and violence. The men are candid about a seemingly hopeless issue which affects us all. Boys and Men Healing is witness to survivors’ ability to thrive and lead fulfilling lives. DVD Menu offers viewing with Spanish subtitles, English subtitles (for Hearing impaired), or English (without subtitles).